Mast Water Technology is a proud distributor of Nicolet Natural Water. Fresh from the forest, Nicolet Natural artesian water is bottled at the source in the middle of the Nicolet National Forest in northern Wisconsin. Water coolers and dispensers are available for rent or purchase, and bottles come in 5-gallon, 3-gallon, or half-liter bottles. Mast Water Technology can deliver water right to your residence or business. We also offer distilled water in 5-gallon and one-gallon sizes. Contact us today to learn more and set up your delivery schedule. When it comes to your family’s health good safe water is the only way to go. Use it at home or in the office. Water is a great alternative to sodas and sugar-filled juices. Give your body what it really wants – a cool drink of water. 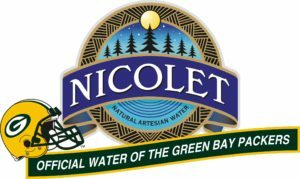 Nicolet is the official water of the Green Bay Packers. And don’t forget about our specialty waters like Water Joe, a great alternative to coffee! Water Joe contains no sugar, no artificial sweeteners, and no taste, just water and caffeine. Mast Water Technology can deliver water right to your door or place of business. Call us today to find out how you can get great water delivered to your door. Give us a call, 1-888-883-6871 to set up your delivery schedule. Mast Water Technology also offers distilled water in 5 gallon & 1 gallon sizes.